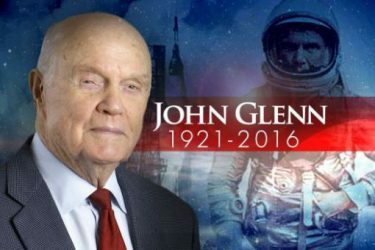 John Glenn, the first American to orbit the Earth, was the last surviving member of the original Mercury astronauts. 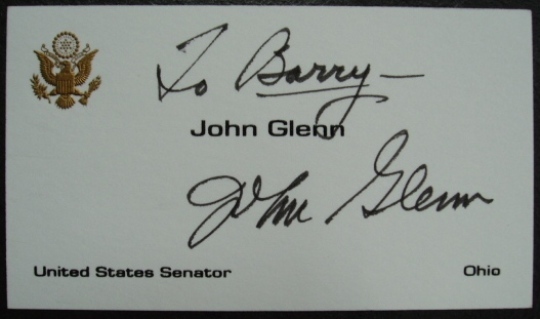 He had a long political career as a U.S. senator for Ohio, but that didn’t stop his pioneering ways as Glenn made history a second time in 1998, when he flew aboard the shuttle Discovery to become the oldest person to fly in space. 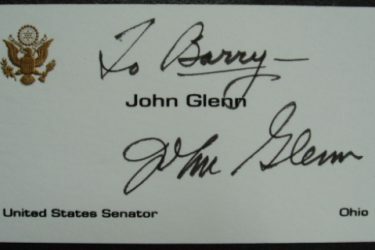 A card measuring 9 x 5 cm, in fine condition, embossed with a gold US Eagle and black lettering and neatly signed by John Glenn in black ink.